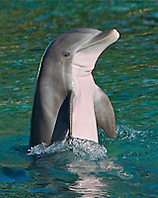 The Bottlenose Dolphin, Tursiops truncatus, is one of the most common and well-known dolphins. 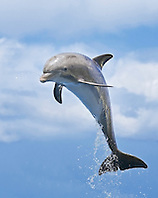 Recent molecular studies show it is in fact two species, the Common Bottlenose Dolphin, Tursiops truncatus, and the Indo-Pacific Bottlenose Dolphin, Tursiops aduncus. 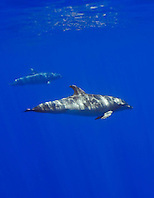 Bottlenose Dolphins inhabit warm and temperate seas worldwide. Bottlenose Dolphins are grey in color and can be between 2 and 4 metres (6.6 and 13 ft) long, and weigh between 150 and 650 kilograms (330 and 1,400 lb). Their most distinguishing feature is the elongated snout, or rostrum which gives the animal its common name. 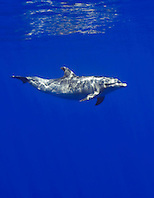 Like all whales and dolphins, though, the snout is not the functional nose; rather, the functional nose is the blowhole on the top of its head. Bottlenose Dolphins live in groups called pods that typically number about 15 dolphins, but group size varies from solitary bottlenose dolphins up to groups of over 100 or even occasionally over 1000 animals. Their diet consists mainly of small fish. Dolphin groups often work as a team to harvest schools of fish, but they also hunt individually. 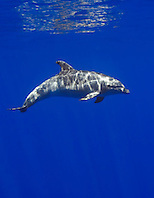 Dolphins search for prey primarily using echolocation, which is similar to sonar. They emit clicking sounds and listen for the return echo to determine the location and shape of nearby items, including potential prey. 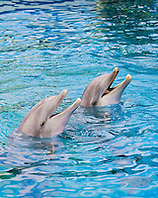 Bottlenose Dolphins also use sound for communication. 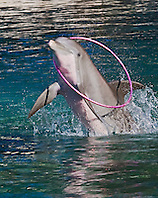 Sounds used for communication include squeaks and whistles emitted from the blowhole and sounds emitted through body language, such as leaping from the water and slapping their tails on the water.